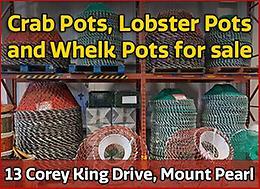 FISHING POTS FOR SALE (Call for discounts) and much more! WELCOME TO CHINA MART Located at 13 Corey King Drive, Mount Pearl (in the Acklands-Grainger Building) We Carry a wide variety of products from Fishing Equipment like Crab and Lobster pots to Decorative Artwork, Cozy Blankets and Home accessories. Incredible deals and unique items not found anywhere else! 4 Winter tires. Not studded. 245/70 R17 load E. About 50% wear. 16" Avalanche winter tires with rims. 225/75/16. Tires were used for only 3 months last winter and have plenty of thread remaining. Paid over $800 for the tires. Rims came off of a dodge journey. 4 Firestone 275/65/R20 winter force tires 60% tread. 500 ,, In great shape, call or text. 4 Winter Rims from Ford Edge 2011 to 2014. 5 X 114.3 - Bolt Pattern. Very good condition. No longer have the vehicle. Like new LT265-70R17 Firestone Winterforce tires on 17” Ford rims. Came off a 2013 Ford F-150 XLT. Used for parts of 2 winters. $1200 obo. Set of 4 wheels and winter tires. Will fit 2003-2017 Honda Accord or Crosstour. Tire size 225/65/17.Lots of tread. Set of winter rims to 6×132, 76 bore. These were on a 2011 GMC Acadia with sensors, used for two yrs only. 235 70R 16 Michelin Latitude X - Ice winter tires on 5 hole rims. Tires are in excellent condition like new, Low kms, only city driving. Rims are a little rusty.